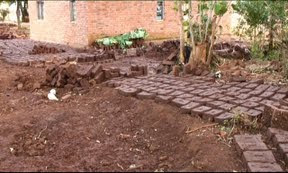 Ever since we entered Malawi, but absolutely nowhere before that, we see small brick making operations. Every few minutes there is either a small area of bricks out to dry, or heaps of them stacks of them, in kilns and drying beds and preparation areas. 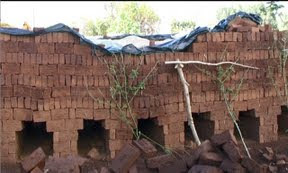 I have been fascinated to find out the process of making these bricks, which are turned into these neat houses everyone lives in, and in Mulanje I got lucky. I wanted to know how they are made, and why there are so many brick makers here. Mostly the bricks are red, although I have seen a dull grey brown and a pale ochre, it seems to depend on the colour of the soil. Robert, our guide for a hike up the mountain, and his friend Unex (he wants to be a programmer) took me to see another mate, who is making bricks to build an extension for his sister's house. That's the first thing I found out: there are so many brick makers, because everyone makes his own whenever they need another house or shed or extension. Bright, the young man who is such a good brother, told me that when he makes his own bricks they cost about 1 Kwecha each, but if he had to buy them and get them delivered, they would be at least 5 Kwecha each, as the transport cost is so high. There are few cars or trucks, and one might even have to come all the way from Blantyre for a delivery, since bricks are too heavy to transport by bike, the way absolutely everything else is carted round here. Bright's house was off the main road down a dirt track, part of a small cluster of brick houses. In the yard a few chickens pecked their way around as a small boy was playing with a brick. Apart from Bright we found a few other boys helping him. An area had been set aside for digging, but Bright told me that it really didn't matter, any soil was good enough for making bricks. 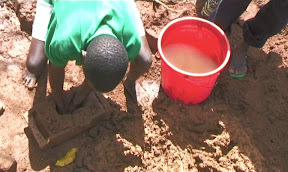 He dug a small hole with a pick axe and poured some water into the hole. Then one of the other boys took his shoes off, pulled up his trousers and stomped through the mud to make a smooth paste. When the mixing was done and the mud had the right consistency, a few handfuls were poured into a wooden mould, which was turned out next to the other finished bricks at the end of a long row. This way each person can make 2000 bricks per day. The bricks are dried for a few days before being fired. Bright told me that one of the big expenses of brick making was the cost of fire wood, so when the builder can't afford the wood, they just dry the bricks and use them without firing. A house like that will last 5 to 10 years. The kiln is another ingenious and low tech construct. Instead of having a permanent firing location the bricks are stacked in a clever way so that there is a tunnel underneath them that is loaded with firewood. After the stack is smeared with mud all over to keep the heat in and evenly distributed, the wood is then burned and re-filled all through the night of the firing. After 4 days the kiln has cooled enough to be broken up and the bricks are ready for building. love the bricks, reminds me of South America, where people go about it in a very similar way, at least in the country side: everybody makes their own bricks when and where they are needed, just air-dried and they are much better insulating than modern building materials. Hope you are all well and have more wonderful adventures than annoying hold-ups.